From the architect. 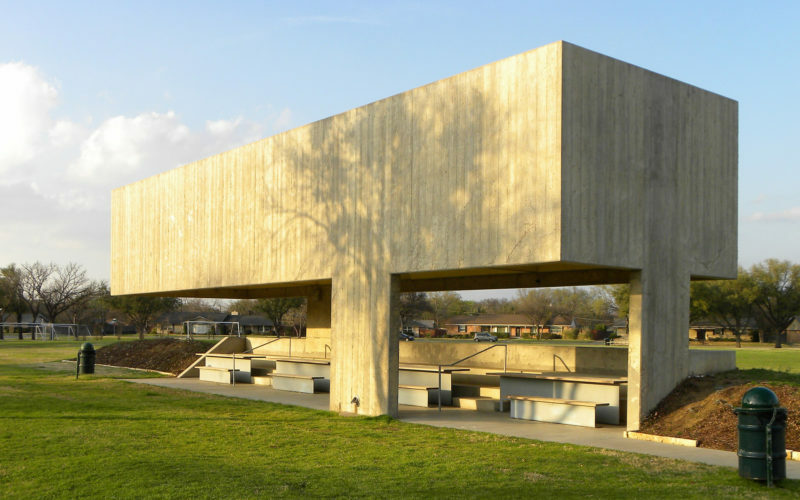 In Dallas, Texas, the Department of Parks and Recreation is working to replace several decaying, minimal 1960s shelters in the surrounding metropolitan public parks. Sandwiched between a community soccer field and playground, this simple pavilion embraces a passive, natural cooling system that becomes one with the spatial design. Inside the pavilion, the heavy shell of concrete opens to reveal four playful, pyramidal voids in the roof. Although a whimsical surprise of color, the ceiling's primary purpose is a natural ventilation system based on a traditional "palapa:" encouraging the hot Texas air to move through the pavilion. Convection breezes are increased as the bold volume perceptually lifts away from the ground, leaving the seating embedded in a berm where the box once was.